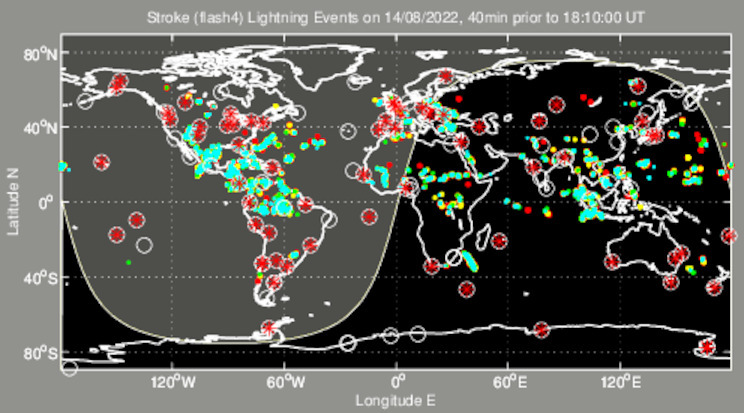 The World Wide Lightning Location Network is operated by the University of Washington in Seattle with lightning location sensors at VLF (3-30 kHz). Most ground-based observations in the VLF band are dominated by impulsive signals from lightning discharges called “sferics”. Significant radiated electromagnetic power exists from a few hertz to several hundred megahertz, with the bulk of the energy radiated at VLF. The WWLLN Management Team, lead by Prof Robert Holzworth of the University of Washington produced these data and images with the cooperation of the universities and institutes which host the stations as listed on the hosts page. For access to the data see the data page and contact us. More research with WWLLN on the research and publications page.